Although the Vikings have multiple players who will be due contracts soon, signs are pointing towards a high-end free agent signing. Earl Weaver was a general manager for the powerhouse Baltimore Orioles in the late 60's and 70's, and we are officially less than three days from the new league year, and free agency beginning on March 14th at 4 p.m. ET. What does a general manager in the MLB have to do with the NFL, you ask? I am always reminded by a quote Weaver once said, "You win pennants in the offseason when you build your team with trades and free agents." This quote told his fans that you do not always want to win the offseason. The Minnesota Vikings, yet again, have a need at the most critical position; quarterback. It seems like they have been there a time or two before. 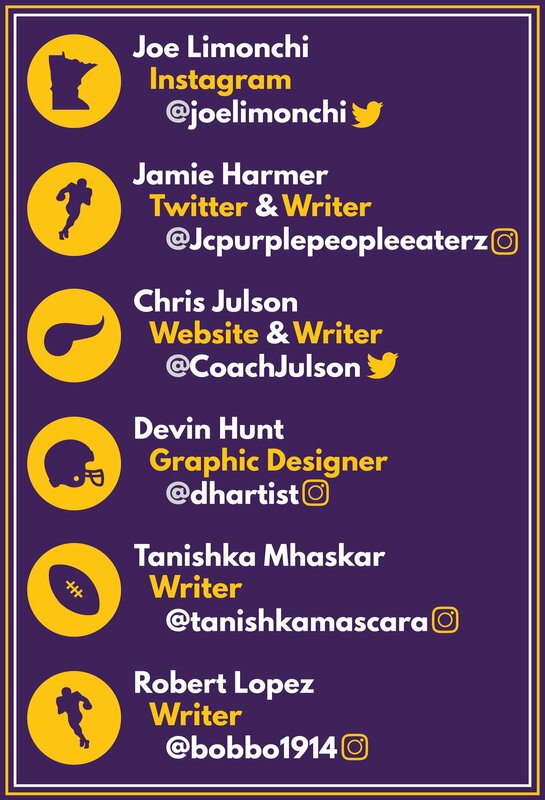 The Vikings have the cap space, an estimated 57 million, to go about this in multiple different ways, leaving Vikings Twitter in a frenzy that I hope soon gets resolved. 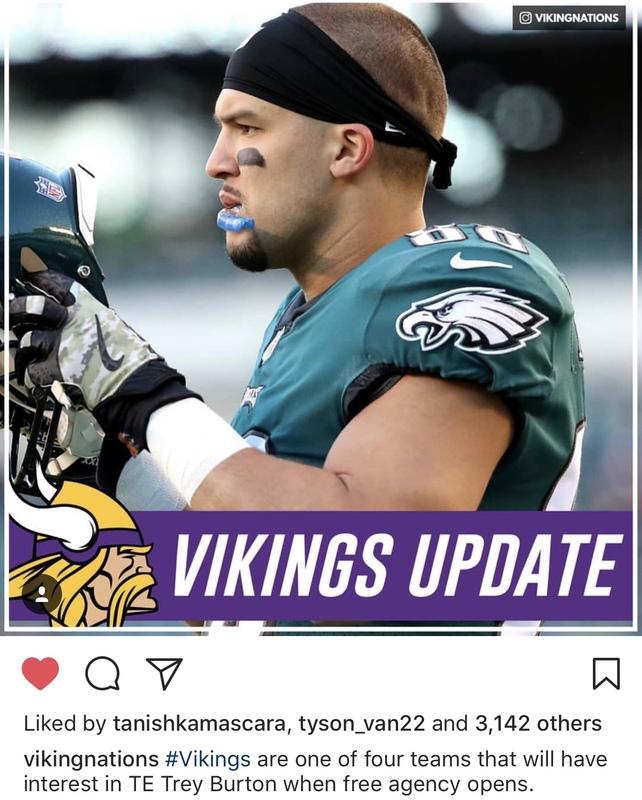 What will the Vikings do? Rumors have been flying around the league, but two, in particular, has stood out. There have been multiple indications that the Vikings are set to offer Kirk Cousins a contract. 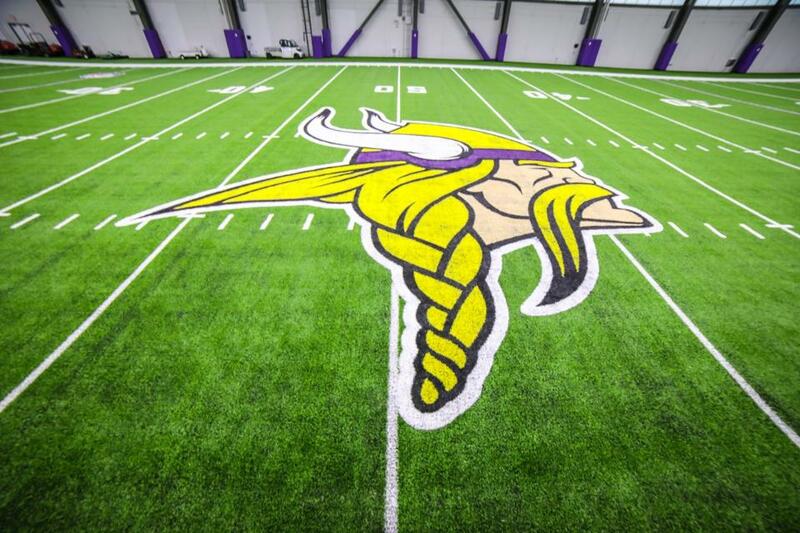 Rumors have been flying around the league that the Vikings, Jets, Broncos, and Cardinals have pitched their claims. 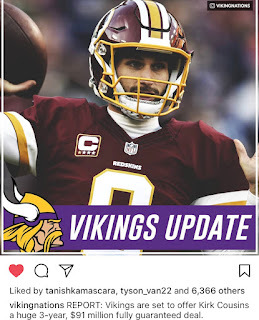 It is a pretty standard theme that everyone believes he will end up signing a contract on Wednesday in Minnesota, around 27+ million dollars a year deal. 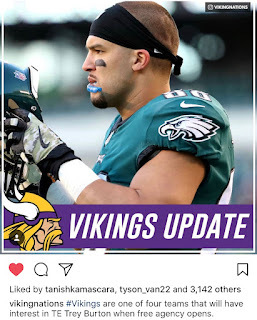 Another rumor around the league is that the Vikings have interest in former Philadelphia Eagles tight end, Trey Burton. The 26-year-old caught 23 passes for 248 yards. He is undersized at 6'3", and the Vikings often have preferred to have a productive blocker next to Kyle Rudolph. Burton has proven to be effective, and DeFilippo would understand if he is capable of adding another dimension to the offense that they have previously been missing. Many fans believe the window of opportunity is two years. Is this the offseason that the Vikings will contradict my belief in spending a fortune on high-end talent? No matter what the conclusion of free agency will be, the draft will be essential to build off of free agency. If you want a complete list of the free agents, visit http://nfltraderumors.co/2018-nfl-free-agents-list/.